Join all the surfers, shapers, designers, artists, and lurkers as they descend on the Del Mar Fairgrounds next weekend (May 5-6, 2018) for The Boardroom International Surfboard Show presented by US Blanks. 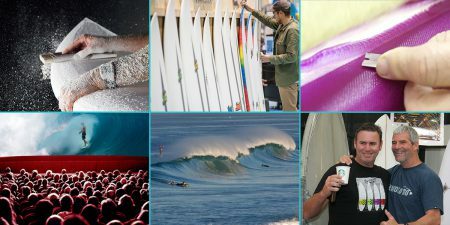 The show features hundreds of incredible surfboards by top shapers, the Icons of Foam shaping contest honoring Marc Andreini, live glassing demos by Douglas Surf Products, the California Gold Surf Auction preview, live music by Hold Fast, Tower 7, and Lay Low, as well as ukulele and guitar builds and demos, and much, much, more like great deals on boards, wetsuits, art and gear. Tickets are $15 a day at the door ($20 for both days) or save $5 and order online. For all the details, please click the link. The Del Mar Fairgrounds are located at 2260 Jimmy Durante Blvd, Del Mar, CA 92014, where the surf meets the turf.